These are our current wine releases. You'll find dedicated sections for red wines, white wines, and some other wine types in the site navigation. It's worth a look around. Clan Club Members receive additional discounts. Aromas of green apple fresh pear abound with an underlying herbaceous character. These aromas continue onto the palate along with classic Finger Lakes slate and mineral depth. This versatile food wine will shine over the next one to four years. This wine is a great example of why you shouldn’t be afraid of residual sugar in Rieslings from the Finger Lakes. The naturally high acidity in our Rieslings provide the perfect counterpoint to residual sugar which provides bigger mouthfeel in the wine. This vintage has a light golden straw color and is very aromatic with essences of orange blossoms, honey, stone fruits and tangerine all rising from the glass. These characteristics are also present on the palate along with apricot and citrus peel. 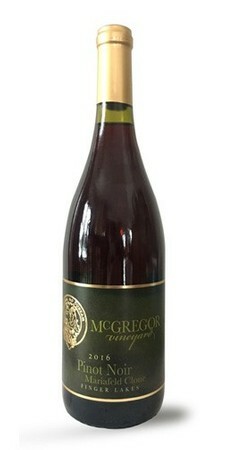 This vibrant, ruby red wine is very aromatic and flavorful. It has a rather understated complexity of aromas and flavors that come alive in the glass as the wine breathes and opens up. Red cherry, strawberry, black tea, forest floor, spice and vanilla. The wine finishes with lingering fruit flavors and velvety tannins. This wine is quite approachable right now, but can easily cellar for at least 3-5 years. This Cabernet Sauvignon is very aromatic, with expressions of fresh ripe blackberries, black rasp­berries, and plums. The rich berry character gives way on the palate to sweet oak and graphite/pencil shaving notes. Rich & soft with a smooth finish of lingering tannins.